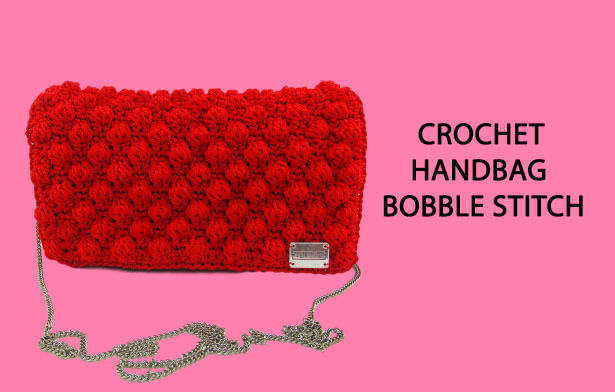 How to crochet a beautiful handbag with bobble stitch!! Materials: polypropylene yarn medium size, 4.25 mm crochet hook. * This pattern is worked over a multiple of 4 stitches plus 2. This instructions is for medium size bag. Row 1: 1sc into the 2nd chain, 1sc in each chain across. Row 2: chain 1, turn, 1sc in each of next 2 stitches, *1 bobble to the next stitch, chain 1, 1sc in each of next 3*, repeat from * to * until the end. Row 4: chain 1, turn, 1 bobble to the 1st, chain 1, *1sc in each of next 3, 1 bobble to the next, chain 1,* repeat from * to * until 4 stitches remain. To finish the row: 1sc in each of next 2 stitches, 1 bobble to the next, chain 1, 1sc into the last. Row 20: chain 1, turn, 1sc in each stitch across. Join the sides with the bag with 1sc in each stitch around. Watch my video tutorial witch shows how to make this beautiful bag step by step.